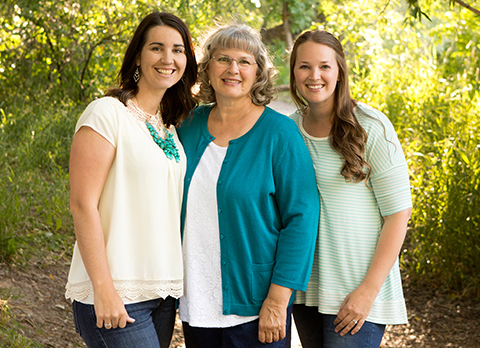 Kiwi Lane Designs is the product of passion…passion for our relationships with family and friends, for capturing the special moments of life in pictures, and for the satisfaction that comes through creative expression. Scrapbooking is the perfect combination of all of these things and is something that the three of us have had in common for a long time. It is something that has brought us together on countless occasions and strengthened our family bond. The idea for Kiwi Lane began to grow in 2008. Each time we got together to scrapbook, we would complain to each other that most of the samples we were finding in magazines and online were for one-picture, one-page layouts that depended heavily on expensive embellishments to accomplish their look. Although the layouts were beautiful, recreating them was a strain on our budgets, and we preferred designing two-page layouts that would fit more photos and tell a more complete story. It was these frustrations that led us to develop a new system that simplified the scrapbooking process and was an endless source of ideas and inspiration. This process allowed us to add as many pictures as we wanted and end up with a beautiful, balanced, professional layout every time. This new style was made possible, in part, because of the gorgeous prints and patterns in our paper stashes. Using paper to create our pages led to layouts that were stunning without our having to spend a small fortune on traditional embellishments. We were ecstatic about the way this system had overcome all of our concerns and made scrapbooking fun again! It completely changed the way we scrapbooked. Soon after this, we realized that this was something which would benefit scrapbookers at all levels. Our desire to share what we had discovered was too strong to ignore! Watching our Kiwi Community grow has brought us such a sense of satisfaction. It has been so gratifying to see the way that the Play-to-Create system has enriched the scrapbooking experience of others, just like it did for us! If you haven’t had a chance yet to learn about our Play-To-Create system, we would love for you to take a moment and learn more. If you have been inspired by our products or our community, and you know someone that may be able to benefit from what you have found here, please encourage them to visit us.